Friends | Here's to Life! Many summers ago, I spent 10 years of my childhood in Davao City. We were moved from Iloilo City, where I was born, to Davao as my Dad was made General Manager of a stevedoring company. As the transfer was midway through a school year, my Mom had no option but to homeschool me till the next school year came round. I was 5 years old then so the school (Stella Maris Academy) gave me the Nursery entrance exams. I passed with flying colors. Maybe it was fate but they decided to let me take the Grade One entrance test. I passed it too. At the age of 5, I was enrolled in the first grade — the youngest of the batch. There is something about being the youngest in your batch forever and ever. You have this insecurity about not being old enough to “know” things that your classmates know, or not being in on secrets because you were still “too young”. When a school year came to an end, I’d secretly hope that when I enter the next school year, I’d find somebody younger than me. But every time I moved up one grade level, I’d find myself still being the youngest. The only thing that held up for me, who was then quite shy as a child, was my being nerdy and brainy. I found myself being elected to key officer positions in class and holding leadership positions even if I was, at times, reluctant to be the head when everyone else was older than me and, in height, towered over me. A bevy of beauty bloggers came together one day in January to get a first glimpse at the latest innovation in makeup: airbrush cosmetics. No, I’m not really a beauty blogger. But I must confess, being surrounded by all these friends who are into it has given me quite an education in the how-to’s of ‘dagdag-bawas’ in the right places to highlight one’s personal facial features. Also there was Phoebe but for some reason, I can’t find a pic of her among my pics of the day! So, what is this airbrush makeup? Think of car painting. Yup, car painting. Did you ever wonder why car paint is not applied with a brush but with spray paint using an industrial compressor? To give the body an even, natural look, right? Well, this concept is now being applied to makeup! This tiny compact GlamBox, which comes in a luscious pink (my favorite color) & black combination, when used with its compressor and gun, sprays a very fine mist of liquid foundation on the skin. The effect is natural, evenly applied, flawless complexion. Glambox is so versatile. It can be used to contour and highlight facial features and it can also be used to airbrush the body for coverage and for sunless tanning. The procedure is easy, actually, according to Valerie Tan, who first showed us a demo of the whole procedure. Pour about 10 drops of the liquid foundation into the gun, choose any of 3 air pressure modes (1-for the eyes, 2-for the face and neck, and 3-for the rest of the body), hold the gun about 6 inches from the area, and spray away! I gamely agreed to be the guinea pig. Why not? There were 3 makeup artists in my midst! 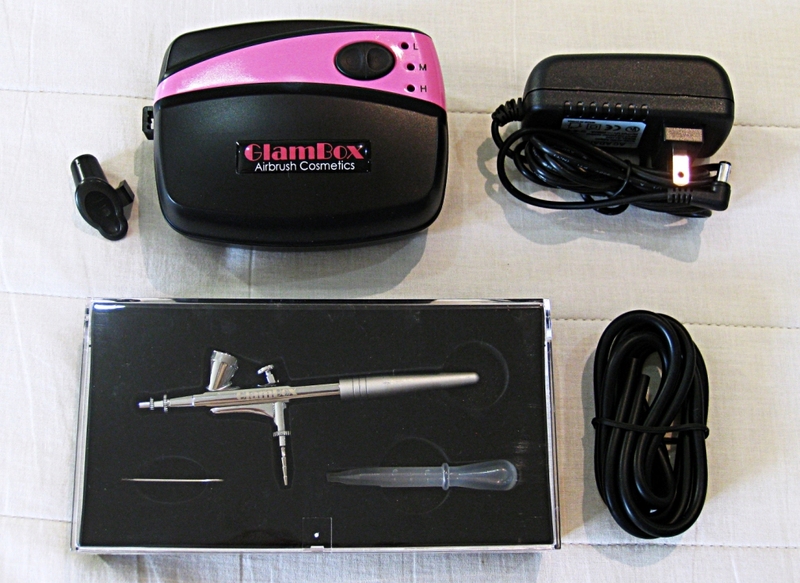 When else can I get makeup done for free — and with GlamBox’s airbrush makeup pa? Here’s my dear friend, Bambi, with what I call her “weapons of mass beauty” making me over. After it was sprayed on me, I hardly noticed the airsprayed foundation. Unlike the usual liquid foundation which can feel cake-y and heavy, the effect of using the Glambox gun and compressor was surprisingly almost NOT there! Bambi finished off the makeup session with eyeshadow, blush-on. I reapplied mascara and lipstick and ***drum roll*** — here’s what I look like after, with airbrush makeup — and clowning around with Bambi. And another one with Hannah, who also got to try the airbrush makeup. GlamBox kits come in two varieties: Starter Set and Deluxe Set. Thanks to Sophie for inviting me to this fun & beautiful event. And thanks to Valerie for introducing me to Glambox. A day Pres. Corazon Aquino passed away last Aug. 1, a website (peaceloveandrevolution.com) was put up on the web by a very young graphic designer. Within a week, the site got more than 20,000 hits, the idea of the couple on one yellow bill caught the attention of the newspapers, became the talk of social networking sites, landed on a Facebook page and snowballed. The graphic designer was Rev Naval. At about the same time, a former Cabinet Secretary, who happens to be a good friend, stumbled on the same idea, proposed it to the Bangko Sentral ng Pilipinas (BSP), and got positive feedback that it was going to be considered in the next redesign of the Philippine currency. This person was former Energy Secretary Vincent S. Perez. At the recent Manila Design Week, I sought Rev Naval out, borne out of a curiosity and desire to meet the guy behind the popular P500 design. He graciously spoke with me for a short while then gifted me with a facsimile of his P500 bill. This Kreative Blogger Award was given to me by my dear friend from my Philadelphia past, Kathleen. Thanks so much, Kathleen! I am thrilled to have been chosen one of Kathleen’s 7 best-loved blogs and as it is with awards like this, it is now my turn to pay it forward and choose 7 of my own best-loved blogs. Of course, I love more than 7 blogs, most specially the blogs of my mommy blogger friends. But for now, I will list the blogs that first come to my mind. 1. Insightful Personhood – My sister in Christ/kumare (both ways)/great friend Aly maintains this blog. Aly is one of the most creative people I have known. She loves scrapbooking and her Christmas gifts are always a delight to receive because she thinks up different ways to wrap the package and decorate it with twirly colored ribbons or a touch of something like a cut-out Christmas tree or hanging ornaments. In this blog, Aly bares her heart. She writes about her family life as well as her insights in her journey as a daughter of God. If there is one blog I can go to to draw inspiration from, it is hers. 2. Heart of Rachel – Rachel is one of my mommy blogger friends. Her blog is aptly titled because it is ALL HEART. She writes about anything and everything close to her heart. She writes about her family experiences, puts up great household tips and anything that catches her heart. When you visit her blog, you immediately notice how bright, colorful and tasteful it is. It gives you a sense that its owner is a happy optimist. Which Rachel is. 3. Memories in the Eyes of the Digiscrapmom – This title fits Liezl to a T! She is my ultimate digital scrapbooking idol — only because I have tried, truly tried, to keep up with the 4 kids’ scrapbooks and am still an utter failure in this department. I have (by last count), 3 plastic stackables filled with long, brown envelopes of the kids’ pictures, schoolwork and other souvenirs. Maybe I do need to go digital instead of tackling the cut & paste style of scrapbooking in the days of my mom and lola. 4. Flipflopping my way around town – Fran’s a neighbor. A really close neighbor. As in — the street right behind ours. And to top it, she blogs mostly about her food experiences. Her blog is eye candy. Colorful, lots of pics, and very light reading. I love visiting and finding out what new restaurants she tried and reviewed. Food blogs are better than visiting restaurant websites because I get the real deal from people who actually tried the food and service. Fran’s blog is one such site. Of course, she is now busy with preparations to move on to another state of life (woohoo!) but she still finds time to do her foodie posts. Keep ’em comin’, Fran! 5. Wifely Steps – Toni is in the last stages of her pregnancy and is awaiting Timmy’s birth. Her blog is all about her journey as a wife. Just reading her posts makes me smile because it is so easy to empathize with Toni’s experiences. 6. The Journey of a Yogini – Meet Chona, my BYFF (Best Yogini Friend Forever). Chronological age separates us but not our free spirits. When we’re together, we talk, laugh and get into just about any topic. I love being with her. Our souls commune. We are both free spirits (or at least trying to be as free as possible within social norms, haha). This yoga blog of Chona’s shows how far into her yoga journey she has come. She started her yoga practice later than me but now, she is a regular in her ashtanga class. When you read this blog, you see the depth of my BYFF’s thoughts (but hey, she is funny when she wants to be too!). 7. TeacherJulie.com – Julie is a special education teacher. Her blog is unique in that she shares her own experiences and knowledge on special education and parenting. But that is not all her blog is about. Julie is a warm, wonderful person whose sunshine personality shines through in her posts. I love browsing her blog and finding posts that make me think deeply or laugh out loud or lead me to resolve to do something. 2. Hugs – I am a touchy-feely person. I easily hug and embrace people (probably sending some people who are not used to this familiarity into uncomfortable fits). And I do love receiving hugs as well. It’s my first instinct when I am around people I love. My teen boys sometimes squirm when I hug them while they are focused intently on World of Warcraft or some other online video game but I am sure this reassures them that I love them to bits. One of the best ways to start a day is to be hugged. They say everyone needs a hug at least once a day. I agree 100% and the more frequently it is done, the better for one’s self! 3. My family – My support system. My life. My reason for being. My loves. 4. Connecting with friends online or in person – This is one of my real loves — being able to connect with friends in whatever way. Lately, I have been trying to find old friends via Facebook and am happy to report that I have been quite successful. Chatting online or meeting up at some mall for a quiet (no, scrap that. I meant — laughter-filled) reunion really takes years off one’s face. 5. Reading books – Bookworm, bookaholic, bibliophile, bookista. That says it all. I just love books! And it’s contagious. My whole family reads. That’s why we all have bad eyes…. 6. Yoga – This is one of my passions now and I must say it has helped my mindset towards many things. Despite being a Type A personality, I am better equipped to deal with stressful situations as long as I have my yoga. I also feel healthier at this stage of my life compared to when I was in my 20s and 30s. 7. Blogging – I have never been able to keep a daily diary like my Mom who has literally filled more than one filing cabinet drawer with her diaries which she started in the 1950s and has faithfully maintained till now. If I want to know what happened, say, on Christmas Day of 1980, she would have the answer. But now I have been caught by the blogging bug and while it is very far from a daily diary, it gives me a chance to put down in writing things and events that I want to preserve for life. Now, for the owners of the 7 blogs I tagged, it is your turn to pass this award on to 7 other blogs you love and list down as well 7 things that you love. I missed the mommy reunion at Burgoo’s last year when Raquel was in town from Germany with her family (though I did see her at Dine’s birthday dinner at The Old Spaghetti House Katipunan). So when Raquel made the trip back to Manila again this year and called for another mommy reunion, I jumped at the chance for another meet-up at Burgoo’s Podium. What do mommies do when they are put together like this? Talk, talk and talk. Haha. But seriously, it was a chance to catch up on each other’s lives, especially Raquel’s. I also got to meet Aileen for the first time and found out that her uncle was someone I knew from my past job at an accounting firm. Of course, being mommy bloggers there were a lot of photo ops too. Good thing, Burgoo’s staff were very accommodating and were patient enough to take our pictures with over half a dozen cameras each time. Here are some pictures from that super fun afternoon. Clowning around & wishing we were as slim as this mirror post makes us look. Last March 21, the boys and I headed out to the Fort Strip to join hundreds of people, young and old, to support Ipanema’s Walk a Green Mile for the benefit of Haribon Foundation. Ever since the Ipanema launch of its GB Seeds Collection, I had made up my mind to join the walkathon. The cause was impetus enough. The exercise I would get out of it as well as the bonding with bloggers were the icing on the cake. The walk started at a little past 5PM. The Uganda Band began playing Brazilian and African beats. At the starting line, confetti rained upon the participants and we all started the 1-mile hike around the Fort, basically walking to Boni High Street, going all around it, and making our way back to the starting point. That entire walk took about 40 minutes and everyone made it back happy to have contributed to a worthy cause. Several blogger friends were spotted and of course, we had the usual blogger photo ops. Click, click, click…. A pair of GB sandals personally signed by Gisele Bundchen was raffled off and no other than Melyn Limjap, a blogger, came away with the prize. All in all, it was an event we enjoyed a lot because I had time to bond with my boys who were attending a semi-blogger event for the first time. The instant dinner we had after the walkathon allowed them to meet some of my blogger friends.